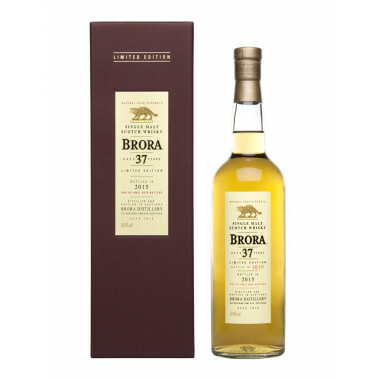 Brora 37 Years Old Scotch whisky is a mighty blend of fruity sweetness, fresh honeyed aromas and wood smoke. Distilled in 1977 and bottled in 2015, this Brora of intense gold colour is quite rare. Only 2 976 bottles of this sweet and strong Scotch whisky have been released, with a caramel sparkling, red fruits and marzipan, coated with the finest cocoa powder. Its perfume evokes a wood fire and then, a lovely sweetened mix meets the nose: accents of raisins, roasted coconut, honey, lemon peel and marzipan. These aromas are contrasted with intense hints of peat, a dash of water revealing a light scent of jam, smooth caramel and intense notes of mint, herbs and perfumed bath salts. Bottled at cask-strength, it develops a perfectly balanced taste of sweet and spices, underlined with a hint of wood smoke. 1 885,00 € tax incl. Nose: sweet, round and well-balanced. Sweet notes are underlined with a light scent of wood smoke. Palate: powerful, at cask-strength. Sweet, then spicy and dry, slightly sooty. A subtle flavour of chocolate truffle and dark cocoa, orange peel, honey, caramel and wood smoke with ripe red fruits undertones. A dash of water reveals a sweeter taste, lighter and slightly more mineral with resfreshing accents of vanilla and pine wood resin. Finish: medium to long and extremely warm. Quite fresh and spicy with aromatic herbs and a light minty scent wonderfully associated with dark chocolate, liquorice and roasted coffee.